Things miscellaneous or otherwise not neatly sorted into other categories. …is being relocated and cleaned up! Same room as before – our guest bedroom/office/workroom – but we’ve moved the shelf unit I used as a painting and building bench to the other end of the room, away from the door. It’ll be slightly closer to my computer desk, which is out of frame to the left in the photo below. I’ll have a bit of natural light from the window just to the right, and more space for shelving along the wall below the window eventually. It will also make the room more usable as a guest bedroom, because the guest bed is now right close to the door and all the messy hobby stuff is at the other end of the room! The relocated workbench. Click for slightly larger. Looking to assemble unique teams for Blood Bowl without spending a lot of money, I’ve been poking around the Reaper Bones collection – Reaper’s relatively new collection of injection-molded figures in a relatively soft plastic. I ordered a couple of figures from my FLGS that seemed usable in Blood Bowl, just to check them out. I got an Ogre Chieftain, a Minotaur, and a Spirit of the Forest, intending to remove the weapons (in the case of the minotaur & ogre, at least) and use them as, respectively, an orge, minotaur and treeman in BB teams. I’ll talk more about all three figures in future posts, but first I have to say that Reaper’s online customer service is awesome. I bought the figures Thursday and realized that evening that the Spirit of the Forest had been packed with two right arms. Friday I confirmed on the Reaper website that the Spirit is indeed supposed to actually have both a left and right arm and sent a short email off to Reaper customer service that Friday evening. Monday morning first thing I had a short email from Reaper asking for a shipping address so they could send a replacement left arm; I replied around mid-day and that afternoon got another email saying my part would be packaged and shipped soon. Wednesday morning I got a notice (with tracking number) saying my package had left Reaper. I’d always heard Reaper had good customer service, but because I can order Reaper figures through Curious Comics & Games here in town had never had any reason to deal directly with them. I’m happy to say the rumours are entirely true, and I’m looking forward to getting the replacement part for my Spirit of the Forest soon! The workbench this week. Lots of stuff going on, see text for details! Across the foreground from bottom right, we have a really, really massive Warg from Reaper Miniatures, being painted up as a quasi-supernatural Terror to inflict on people in games of Pulp Alley; a dino skull and some bones being done up as Blood Bowl markers for my Lizardman/Crocodilian team; the previously-mentioned finally completed pulp-era luggage and the Kali bronze; a quartet of light deck guns from Pulp Figures suitable to arm all manner of vessel or vehicle; three more Blood Bowl markers made of Renedra plastic barrels intended for my brother’s Scotling team. Finally, last but not least, clipped into the two wooden clothspins (useful things to keep around a hobby bench!) there’s a pair of spiked footballs from Impact Miniatures. Blood Bowl again, obviously. This assembly is only slightly tarted up and organized for the photo, everything here really is in progress or was recently finished and it really has been getting that crowded on my painting bench the last while. 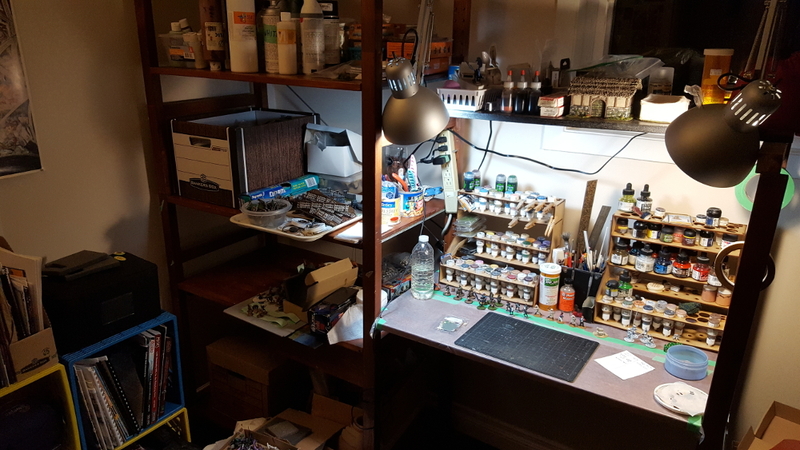 It’ll be satisfying to get more stuff completely finished, into storage and more importantly, onto the table and into use!